wet chinchilla after bath. Chinchillas normally take dust baths, but this one needed a wet bath, apparently. And no, he did not die या explode contrary to much false information online.. Wallpaper and background images in the जानवर club tagged: chinchilla bath. Chinchillas normally take dust baths, but this one needed a wet bath, apparently. And no, he did not die या explode contrary to much false information online. 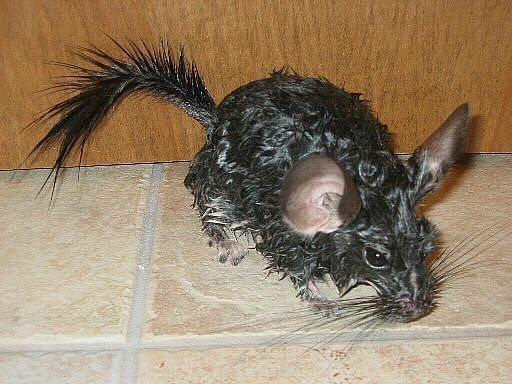 YOU DONT GIVE CHINCHILLAS A BATH IN WATER IDIOT! that's cruel you should not be an owner! who the hell told you he needed a wet bath and for what reason? i really hope that you got your chinchilla took off you and giving to someone who knows bout chinchilla!!! even if chinns have damp fur it will become rotten!! Yes the owner was an idiot! This is how a chinchilla gets a fungus on their skin and their fur starts to fall out. It is very hard and expensive to cure. You have to use a vet and they can over toxify on the dose because it is so rare. Chins also can get a fungus from too high humity and stress. This poor thing is stressed. This is blantant animal cruelity! chinchillas should be offered a bowl of chinchilla dust to bathe in 1-2 times weekly. giving them baths in water is totally not worth the risk of disease! WOOOOT WOOOOT!???!!!! HEY!!!! WHAT AN IDIOT OWNER!!!!! It must bath on dust so it feels good. OR IT CAN GET WEIRD FUNGUS ON ITS BODYY! THE FUR CAN BE LOSE!!!! Guys, stop panicking. I've owned my chinchilla for 2 years, and while it's not recommended to give a chinchilla a bath in water, it can be important to help nurture them back to health from certain diseases, and since some chinchillas do have asthma or respiratory problems, it's important not to put them in a dust bath as they may panic or inhale dust too much, and this could kill them. For almost all other situations, yes. You should give your chinchilla a dust bath in very finely ground pumice dust.